Around 2018-11-29T12:00-07:00 (lunch time yesterday in Denver) I was testing some changes to Hazer, my GPS receiver evaluation project, by comparing its results using the Ublox-8 based BU353-W10 GPS receiver with those of the real-time sky map displayed by the web site in-the-sky.org . I noticed that my BU353-W10 was reporting the satellite GPS PRN 4 as "in view" with a zero elevation and zero azimuth - due north right on the horizon. That vehicle wasn't reported by the sky map. A little web-search-fu told me that there is no GPS PRN 4. The GPS space vehicle using Pseudo-Random Number code #4 had been decommissioned and its PRN - the numerical key used to uniquely encode data over its CDMA-based air interface - has not yet been reassigned to another satellite. 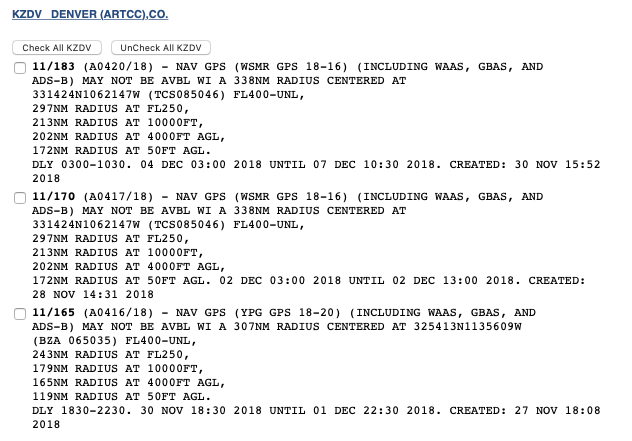 GPS PRN 4 does not appear in the most recent GPS almanac. Before I could do much else, PRN 4 dropped from view. PRN 4 reappeared the next morning around 2018-11-30T09:00-07:00 at the same azimuth and elevation. I quickly dumped the raw NMEA strings from the BU353-W10 and verified using [NMEA 0183 Version 4.10 pp. 96-97] that I wasn't decoding the GSV sentences incorrectly. However, I noticed that the elevation and azimuth for PRN 4 weren't actually zero: they were empty strings, which Hazer numerically converted to a zero. Its signal strength of 36 dBHz was a reasonable value that changed over time. The elevation and azimuth makes sense, considering the vehicle doesn't appear in the GPS constellation's almanac of satellite orbits; the GPS receiver couldn't compute its position. The presence of 04 in the GSV sentence in this case merely means something using PRN 4 is being received, not that the satellite is literally in view in the sky. I coded up a change to Hazer to detect this and mark it, and to gpstool to display a ? next to that SAT entry. I was able to test this before PRN 4 again dropped from view. GPS PRN 4 continues to drop from view and reappear. Its period of appearance does not coincide with the GPS orbital period. Neither [NMEA 0183 4.10] nor [Ublox 8 R15] suggests any interpretation of the empty elevation and azimuth fields. Forty years of experience tells me that this is somehow is a bug in my code, or (less likely) in the GPS receiver. But it does occur to me that PRN 4 would be useful for testing a ground-based GPS transmitter; the erratic daytime period of its appearance would make sense for such an activity in the continental America time zones. In the spirit of We have met the enemy, and he is us, I checked for a Notice To Airmen regarding planned GPS disruptions and found this. The UTC time stamps don't quite match up with when I observed GPS PRN 4. But this may yet be more GPS testing at the White Sands Missile Range (WSMR) in New Mexico or (in the last of the three notices) the Yuma Proving Ground (YPG) in Arizona. 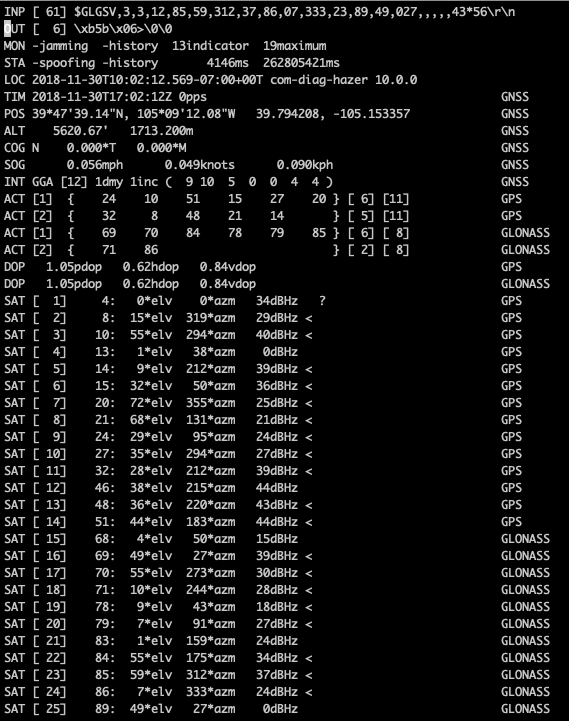 To give you an idea of the comings and goings of the mysterious GPS PRN 4, here is an excerpt from the system log in which gpstool now logs them, for roughly a twenty-four hour period. An octothorpe indicates an initial state where gpstool has just started and the status of PRN 4 is not yet known. A question mark means GPS PRN 4 came into view (or if the tool had just started, was already in view) with a zero azimuth and elevation. A space means GPS PRN 4 dropped from view. The initial and maximum signal strengths, and the duration in milliseconds, is logged. All times are Mountain Standard. You can see that the duration that the transmission using PRN 4 ranged from a second to a half an hour. The times of the transmissions stopped at 20:00 (8PM) MST and resumed at 06:00 (6AM) MST. That's even more evidence to suggest that this is a rogue terrestrial GPS transmitter using PRN 4 somewhere in the continental U.S. The U. S. Coast Guard straightened me out. ON APPROXIMATELY 10 OCT 2018 SVN36 WILL RESUME TRANSMITTING L-BAND UTILIZING PRN04. AT L-BAND ACTIVATION, SVN36/PRN04 WILL BE UNUSABLE UNTIL FURTHER NOTICE. ADDITIONALLY, NO BROADCAST ALMANACS WILL INCLUDE SVN36/PRN04 UNTIL FURTHER NOTICE. "SVN36 was removed from the active GPS constellation on 21 February 2014 (ref. NANU 2014019). It is now a "reserve" satellite, located near slot C2. SVN36 temporarily transmitted L-band signals as PRN10 between 17 September and 16 October 2015 inclusive (ref. IGS monitoring). It was set unhealthy and not included in broadcast almanacs (ref. NANU 2015080). SVN36 transmitted L-band signals as PRN04 between 20 July and 28 November 2017 (ref. NANU 2017070 and IGS monitoring). It was not set healthy and not included in broadcast almanacs." In an interesting turn of events, the recently launched SVN74, a new Block IIIA GPS satellite that is the first of an upgrade to the GPS constellation that will bring a variety of new capabilities, will be using PRN4, the same pseudo-random noise code that was being used by the decommissioned SVN36 that I've been watching. I have to wonder if the use of PRN4 in SVN36 was some kind of test with ground systems done in advance of the SVN74 launch.